Rohan joined RASWA Brass in 2011 after a 30 year association with Canning City Brass Band including 13 years as their Principal Cornet. He joined the front row Cornet bench with RASWA prior to moving to Flugel Horn in 2012 where he is now a regularly featured soloist. In addition Rohan is one of the bands in-house arrangers and has numerous charts appearing in the bands “PLS” series. 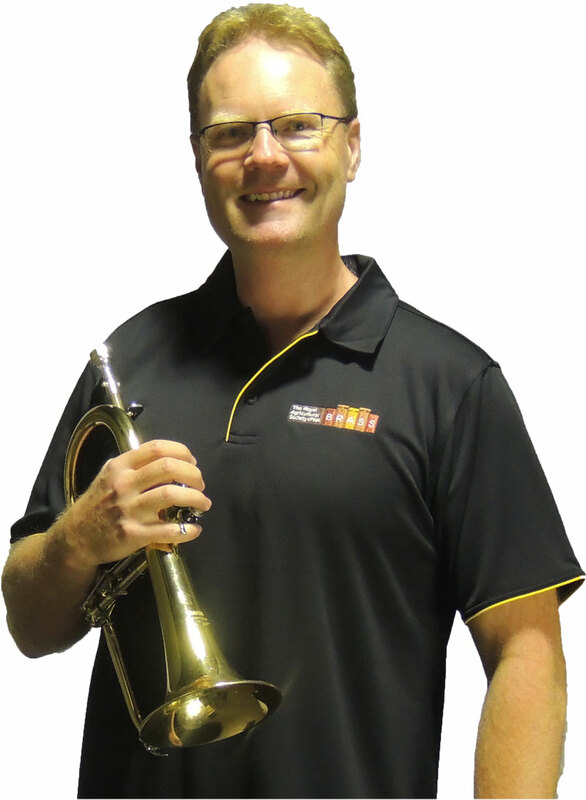 As a third generation brass bandie Rohan has always had a strong connection in the brass band scene but he has had a varied musical background including 12 years as a reservist musician in the Australian Army Band Perth. He was a multi instrumentalist with the band, joining on EEb Tuba and often attending gigs with Tuba, Euphonium, Trumpet and Cornet in hand. He has helped out most brass bands around the state over the years and many local Concert Bands. He has played in many community Big Bands and was Musical Director of his own Swing Band. Rohan is a CPA and is kept busy outside of work and band activities with his 3 children. Sarah picked up her first tenor horn in 1980 and a year later joined the Rockingham Community Brass Band. She played in Southern Districts Brass Band from 1990 – 1999 covering various principal positions. During this time Sarah also played trumpet with the SGIO Youth Concert Band and the WA Symphonic Wind Ensemble. In 2000 Sarah joined the then named Midland Brick Brass on cornet to tour Singapore with the band. After a short stint on baritone she then moved to the horn section and continues to play Principal Horn today. Sarah has been an active member of the band committee since 2001 and has been secretary of the band since 2009. Sarah has won the State Champion of Champions title on seven occasions on both Cornet and Tenor Horn. She won the Norm Snow Trophy for best brass player within a band at the State Band Championships in 2010. Sarah was honoured to play with the National Australia Brass at NABFest 2012 and 2014 in Melbourne. Sarah has a Bachelor of Education in primary school teaching and has worked as a Primary School Music Specialist and Brass Instrumental Teacher for over twenty years. Imy began playing Cornet with the Marion City Band in Adelaide in 2002 after moving from Scotland with her family in 2001. She competed nationally with the band as they progressed from D grade to B grade, and competing in A grade at the state competitions. She has performed for state and national solo competitions on Bb and Eb cornet with varying degrees of success. She relocated to Perth in May 2017 to be closer to family and has taken up tenor horn as a new adventure. In her professional life she makes a fantastic cup of coffee and friendly small talk to the residents of Aveley.